Synopsis: With two kinds of magick at odds inside her and two gorgeous men vying for her attention, Tammy Jo Trask is used to being pulled in opposite directions. But in the latest Southern Witch novel she’ll have to make some serious decisions—like how she intends to stay alive. Review: I waited for the release of this novel for a long time and the re released of the previous volumes has allowed me to see this volume coming little by little. Of course, it was pre-ordered as soon as possible and I was eager to read it after seeing some glowing reviews about the story. It’s been several years since the previous volume was released and I do not remember in detail everything that had happened before. However, we find our heroine Tammy Jo experiencing new problems. Oh yes, because there are many ones … Zach is back in town and is determined to recover her even if all that happened during his absence could change that. Bryn meanwhile remains determined to keep the young woman with him and to make her succumb by any manners. But while Tammy must choose between the two men in her life, a crucial choice indeed, other events will intervene completely upsetting her daily life. It seems that an invisible skeletal creature monitors her, a fae is trying to get something from her by all means and a young woman comes to her door asking her to be her friend. Evangeline is an unstable person who made ​​several psychiatric stays but still nice and innocent in all circumstances. She is fragile but strong at the same time and she remains determined in her choice whatever the others might try to say. This is an enigmatic young person and I’m sure we’ll see her soon in the rest of the story. Even Tammy Jo falls under her spell and decides to help her escape her family as she is saying that they want to kill her. But by that, she does not know in what she will embark. While Vangie mysteriously disappears, it seems that her history is far more important than they could have expected and we could in this way learn even more about Edie and her death. Tammy is changing significantly over novels. Her fae side appears more clearly and she fears that Bryn or Zach will abandon her because of it. It was however very interesting to see the two sides of the young woman as well as her limits in extreme conditions. Moreover, whatever she does, she is always accompanied by people who are close to her and hope to keep her alive as long as possible. Things get quite complicated when we see the situations in which she ends up. She will have to finally choose the man she wants to stay with and it’s true that I fully agree with her choice. I am also curious to see more of their relationship in the next book. In terms of the plot, I thought it was well put together but it’s true that some choices of the author seem pretty well found but some were some quite surreal even though it does not really pose a problem here. However, it is true that I am a little anxious for the future because I am afraid that all will be a little too much but it remains to be seen. In any case I had a great time with this novel and I am looking forward to read more because the end announces us major events in the next volume. This is a nice set mixing magic, fae, vampires, all accompanied by a good touch of humor. 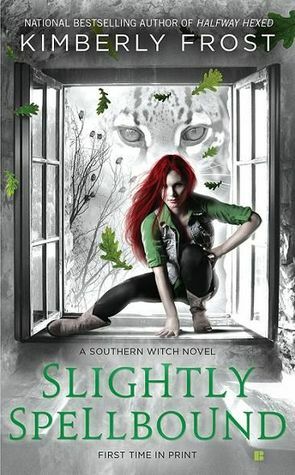 This entry was posted in Kimberly Frost, Southern Witch, Urban Fantasy. Bookmark the permalink. I haven’t heard of this series, but it sounds good. I always like it when a book can be suspensful and funny. yes it’s a really nice series! I really hate when an author overthinks and puts WAY too much story IN the story. xI It is hard to make it work. Hopefully the next one is just as good! it’s a little difficult. But it was good, I’m curious to see how the sequel is. I just barely started this series but I already absolutely love it! I am so happy you are reading it too and that book four is just as great as the others! I am so excited to continue this series now! I am loving that you are reviewing all these older series. I have had my eye on this series but haven’t tried it. I am glad that this book was such a winner, makes me want to dig in. I am not a fan though of the new cover, I liked the older ones better. Why does your review have to be so good and tempting..it is book four. *sighs* you are adding to many books to my tbr pile. lol but well if it’s a good one, it doesn’t count. That’s awful you had to wait so long for this one, but I’m glad you liked it. Love the cover. Thanks for the review Melliane! I have only read the first book, but now I am eager to discover more! I’m always in awe with people who can suffer through a book involving a love triangle. Lol. I’m glad this one continues to be wonderful for you, Melliane! Not heard of this series but it sounds interesting so I got to check it out. Great review! I was really impatient to read it last year. This is great Mellanie! I picked up the first book on the series a while back in of those audible sales, but I haven’t got to it yet, I guess I need to get moving. I hope you’ll enjoy it! I’m curious! this looks and sounds pretty badass. Have to add it to my wish list. ooh this series sounds truly excellent! I’ll definitely put these on the TBR. Loving the cover. Not an author I have come across I’ll be sure to check her out further. I met this author and she is so sweet! I so need to read this series and it is on my must read series wishlist! I’m glad you enjoyed it. you met her? So lucky!